There are several ways to perform a quad stretch. 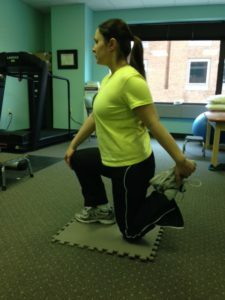 Below is a picture and description of an alternative to the basic standing quad stretch. Kneel on the floor with one foot out in front of you. Take a few seconds to get your balance. Reach back and grab your back foot and pull up to get the desired stretch. Hold for 30 seconds. Repeat 2-3 times.